Detail from Edward Burtynsky (Canadian, b. 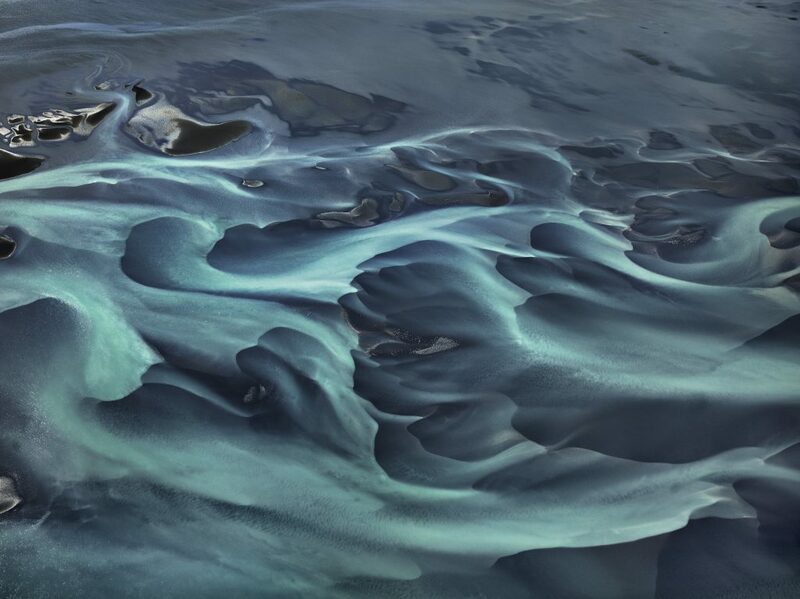 1955), Olfusa River #1, Iceland, digital chromogenic print, 2012. © Edward Burtynsky. Image courtesy of Nicholas Metivier Gallery, Toronto; Howard Greenberg Gallery, New York; and Bryce Wolkowitz Gallery, New York. According to state officials, Coastal Virginia is home to the second largest U.S. population at risk from climate change (second only to the people of New Orleans). Because of the added problem of land subsidence, sea levels along the Virginia coast are rising faster than the global average, with some estimates projecting a relative sea level rise of two to five feet within 100 years. The area includes major shipping ports and the world’s largest naval operation. 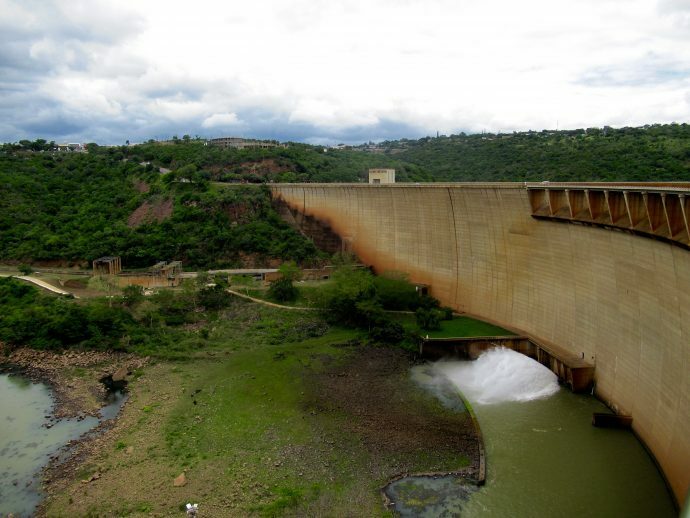 The rising waters therefore pose immediate threats to international commerce, national security, and the health and wellbeing of the more than 1.7-million people living throughout the region. At the Chrysler Museum of Art in Norfolk, Virginia, these issues confront us daily. The museum faces the Hague, an inlet of the Elizabeth River and one of the tidal waterways connected to the Chesapeake Bay. The roadways surrounding the museum become unpassable due to storm surges as well as so-called blue sky or nuisance flooding (when on cloudless days water gathers due to downstream flows and high tides). Although the museum’s first floor is above the currently predicted 100-year flood level, the building can become an island during high water incidents. As part of the museum’s recent expansion and renovation, the institution developed an emergency preparedness plan that focused primarily on water risks. As a result, the museum installed emergency floodgates and relocated all mechanical systems and art storage to elevated locations. When the museum hosted the travelling exhibition Edward Burtynsky: Water (February 12–May 15, 2016), it offered us the opportunity to address the sea level issues that bedevil our community while enhancing our commitment to bringing art and people together. Through a combination of exhibitions, public programs, and partnerships, the Chrysler served as a community hub where we encouraged visitors to consider water from multiple perspectives and to share their understanding with each other. The experience exceeded our expectations and will now serve as a model for future exhibition planning and programming. It has shown us how to develop synergistic opportunities that bring art historical and social concerns together as we fulfill our mission of using art to enrich and transform peoples’ lives. Edward Burtynsky (Canadian, b. 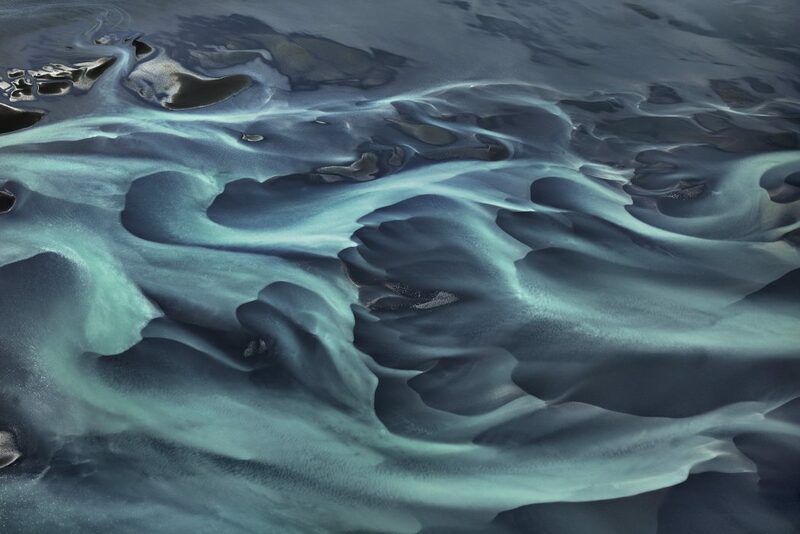 1955), Olfusa River #1, Iceland, digital chromogenic print, 2012. © Edward Burtynsky. Image courtesy of Nicholas Metivier Gallery, Toronto; Howard Greenberg Gallery, New York; and Bryce Wolkowitz Gallery, New York. The exhibition included about 60 enormous color photographs (starting at about 4’ x 5’) made by the Canadian artist Edward Burtynsky (b. 1955). Created over a five-year period, the images investigate the systems humans use to capture and control water—dams, wells, canals, and irrigation pumps—and their ecological repercussions—dry lakebeds, abandoned farmland, and vast algae blooms. Often taken from a birds-eye or aerial perspective, the photographs are highly abstract, even painterly, playing with one’s sense of scale and depth. Although a far cry from traditional environmental or documentary photographs, Burtynsky’s colorful and monumental abstractions raise environmental awareness in unexpected ways. When confronted by environmental issues, many of us feel overwhelmed by the magnitude of the situation. By encouraging people to puzzle through issues of form, color, and scale, Burtynsky’s seductive images compel people to consider ecological issues more carefully. Looking closely becomes an important step for grappling with major environmental problems. To extend and add nuance to the themes of the Burtynsky show, the museum organized three additional exhibitions. Intrigued by Burtynsky’s truth-claim—the notion that the camera offers a distortionless picture of the world—we also organized a collections-based photography show that interrogated the ways photographers have manipulated both their images and the natural world in order to create images of the land. The resulting show, New Light on Land, offered an eclectic selection of photographs—from environmentalist critiques to grand visions of the untrammeled earth—to examine how nature has inspired photographic innovation and creativity since the advent of the medium. Organized into broad themes, the show explored photography’s role in the rise of landscape tourism, in the perception of foreign terrain, in the relationship between people and the earth, and in the expressive possibilities of nature. The photography show went hand in hand with a collection-based show of picturesque seascapes by William Trost Richards (1833–1905). Combining sketches, finished works, and the artist’s materials, the show invited visitors to explore Richards’ working process as he sought out direct encounters with nature’s beauty at a time of rapid urban growth. 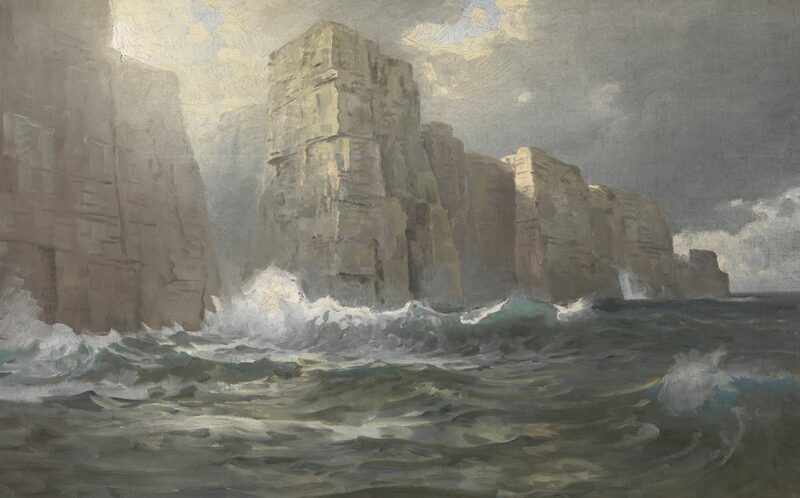 William Trost Richards (American, 1833–1905), Rocky Coast (probably Cornwall), ca. 1890s, oil on canvas, gift of Edith Ballinger Price, Chrysler Museum of Art. In our glass galleries, we exhibited Cities: Departure and Deviation, an installation by artist Norwood Viviano. 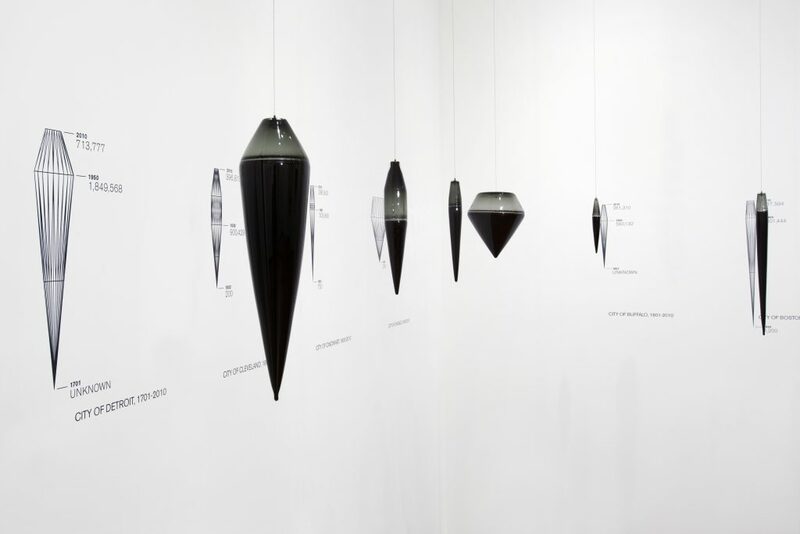 Composed in shades of white, black, and gray, Viviano’s hanging blown-glass pendants read as graphs, plotting the growth and decline of urban populations (width) over time (height). The forms may seem straightforward, but by turning statistical information into alluring aesthetic forms, Viviano, like Burtynsky, draws viewers into a deeper analysis of ecological change. Forms that represent cities like New York show ceaseless and startling growth, while those that map cities like Flint, Michigan, show booms and busts, inviting viewers to think about how industry, race relations, and the environment affect population. A form Viviano made of Norfolk, Virginia, for example, remains relatively thin, with slight tapering in the 20th century on the heels of school integration and Massive Resistance. One wonders what will happen going forward as the waters encroach upon the city. Norwood Viviano (American, b. 1972), installation detail of Cities: Departure and Deviation, 2011, blown glass and vinyl cut drawings. Installation photograph by Ed Pollard, Chrysler Museum Photographer. Courtesy of the Chrysler Museum of Art. The museum’s education and public programs team developed a range of activities to engage diverse audiences. These included a variety of traditional exhibition-related events: a Q&A with Burtynsky; a screening of the photographer’s award-winning film Watermark; a lecture by Pulitzer Prize-winning photographer Preston Gannaway, who discussed her documentary photographs of Norfolk’s at-risk Ocean View neighborhood; and our most popular Family Day to date. The Family Day welcomed 1,500 people to the museum with kid-friendly activities, and the education team created a family guide that helped visitors of all ages explore Burtynsky’s photographs. Preston Gannaway (American, b. 1977), Twins, 2013, from the series Between the Devil and the Deep Blue Sea. © Preston Gannaway. 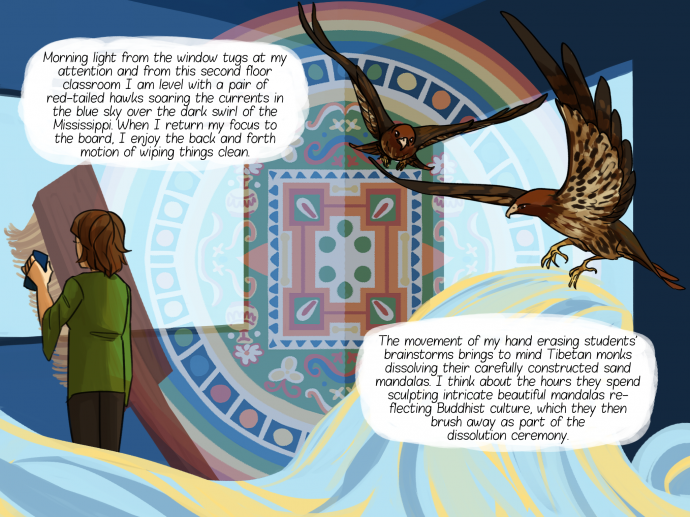 Image courtesy of the artist. The museum staff organized nontraditional events in order to open up the themes of the exhibitions in innovative ways. For example, in addition to standard docent tours, educators led a walking tour that connected the museum’s exhibitions with an exhibition in the neighboring arts district. That show included work by more than 20 artists with ties to Coastal Virginia, many of whom address the unique features of the region, including its waterways. 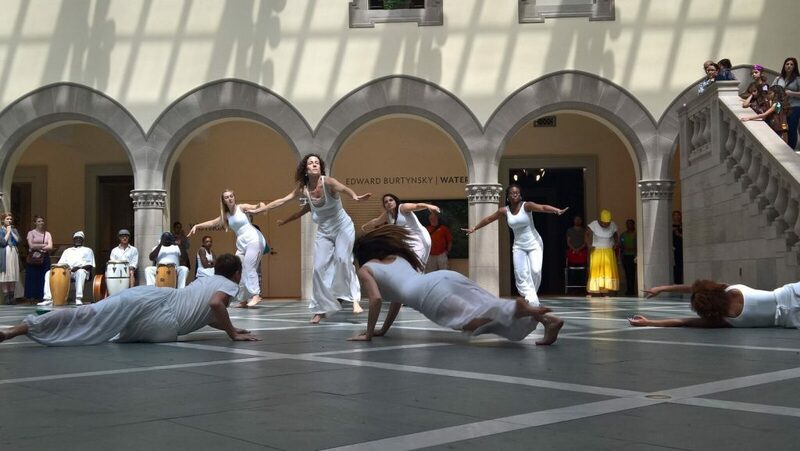 The museum hosted two unique movement performances that investigated the theme of water from symbolic and religious perspectives. In Water Relics, a performance choreographed by dance professor Megan Thompson and theater artist Jenifer Alonzo, dancers led visitors through various museum spaces, using the architecture and their gestures to enact a series of vignettes inspired by an ancient Greek flood myth while evoking the sensation of descending through the depths. In Waters in our Midst, choreographed by dance professor Ann Mazzocca, dancers performed a series of movements drawn from Afro-Caribbean folkloric traditions that call upon Yoruba orishas, or divinities, associated with water. The dance projects were conceived of independently, but they both succeeded in engaging visitors’ haptic and affective senses and in attracting new audiences to the museum. Waters in our Midst. Photograph by Maegan Douglas, Chrysler Museum Public Programs Coordinator. Courtesy of the Chrysler Museum of Art. Through strategic partnerships, the museum became a site for interdisciplinary study. Partnering with the Chesapeake Bay Foundation, the National Oceanic and Atmospheric Administration (NOAA), and Old Dominion University, the museum hosted the annual Blue Planet Forum. About 250 people attended the event, which included lectures by Russell Lord, curator from the New Orleans Museum of Art who organized the Burtynsky exhibition, nature photographer Dave Harp, the former EPA advisor for the Chesapeake Bay Jeff Corbin, and the Chesapeake Bay director of NOAA Peyton Robertson. The event examined how works of art can be used to engage scientific questions and raise awareness about the environment. Working with Virginia Sea Grant, Old Dominion University, and the Hampton Roads Planning District Commission, the museum also hosted the Adaptation Forum, a quarterly meeting designed to bring together flooding adaptation specialists. The event was attended by about 150 visitors, including municipal and state government officials, scientific researchers, private sector engineers, and NGO representatives, and through a series of lectures and dialogues, they shared recent research about resilience, risk reduction, and adaptation to sea level rise. With the museum as the site of the forum, additional speakers were invited to broaden the discussion to art and museums. Chrysanthe Broikos, curator of the National Building Museum, spoke about developing museum exhibitions that can raise awareness and inspire action related to environmental issues, and artist Norwood Viviano and oceanographer George Mcleod discussed their gathering and use of laser data to create works of art. While the water-themed exhibitions and programming enabled us to facilitate discussions about sea level rise, they also allowed the museum to establish itself as a collaborator in the region’s broader preparedness efforts. The City of Norfolk has recently appointed a Chief Resiliency Officer to address flood adaptation issues, and the museum will serve as a forum for strategizing city-wide flood mitigation initiatives. The museum has also begun participating in the Norfolk Resiliency Office’s outreach programs, like those teaching residents how to reduce rainwater flooding through landscaping and rain-capture devices. Again working with the city, the museum has helped write a National Endowment for the Arts grant for a public art project that will respond to sea level issues and a museum representative will serve on the selection committee. Finally, the museum education team will design its annual summer camp as a STEAM (science, technology, engineering, arts, and mathematics) program that investigates water in all its forms, and the educators will lead programs at a new statewide charter school that challenges participants to design a museum capable of embracing and responding to water. 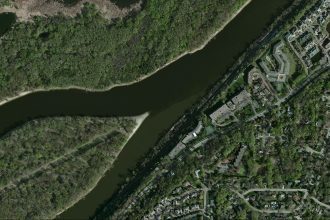 For a collection of studies and statistics, see Old Dominion University’s Center for Sea Level Rise: www.centerforsealevelrise.org. Feman, Seth. 2016. “Finding Common Ground in Coastal Virginia: The Chrysler Museum Faces the Rising Tides.” Open Rivers: Rethinking The Mississippi, no. 3. http://editions.lib.umn.edu/openrivers/article/finding-common-ground-in-coastal-virginia-the-chrysler-museum-faces-the-rising-tides/. Download PDF of Finding Common Ground in Coastal Virginia: The Chrysler Museum Faces the Rising Tides by Seth Feman. Seth Feman is the Curator of Exhibitions and Acting Curator of Photography at the Chrysler Museum of Art in Norfolk, Virginia, and a doctoral candidate in the American Studies Program at the College of William and Mary. His dissertation on modernism in Washington, DC, along with his other published work on American art, historicizes aesthetic experience by examining how qualities of affect, mobility, and vision become embedded in museum spaces, the language of media, and specific works of art. What is Clean Water Worth? 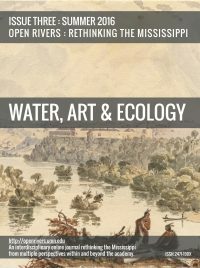 This issue of Open Rivers marks several new emphases for us. But then, when it’s only our third issue, there are going to be new emphases, right? What we have here originates, I think, more from a foundation in scholarly inquiry than some of our previous work. It is less oriented to the Mississippi River. And it was proposed by guest editors, Nenette Luarca-Shoaf and Laura Turner Igoe, who are both art historians. Water is a slippery subject: its visual and material properties spur intellectual inquiry and spiritual reverie; its fluctuating form repels categorization and confounds claims of ownership as it crosses property lines and national borders; and river and ocean currents facilitate commercial exchange along with environmental exploitation. A constant flow of watery images streams through our newsfeeds almost daily. Videos, infographics, animations, flow charts, and various other forms of visual communication tell us that water is either in excess or retreat, revealing that we have too much or too little. Open Rivers guest editors Nenette Luarca-Shoaf and Laura Turner Igoe contacted Gwen Westerman, professor, visual artist, and an enrolled member of the Sisseton Wahpeton Dakota Oyate. Re-imagining the River: The Transformation of New York’s Waterways in Marie Lorenz’s Tide and Current Taxi. For more than ten years, artist Marie Lorenz has been creating a work of art called the Tide and Current Taxi. For this project, Lorenz transports one to four passengers along the myriad waterways of New York City (and occasionally other destinations) in a small boat made by the artist. Nearly twenty years ago Thomas Tweed and a host of collaborators, responding to the cultural and historiographic shifts of the era, called for narratives of the United States' religious past that "draw on new motifs and plots and include a wider range of settings and characters" than those available at the time. Minnesotans are fortunate to live in a land rich in water resources. Clean water is part of our sense of place and cultural identity. 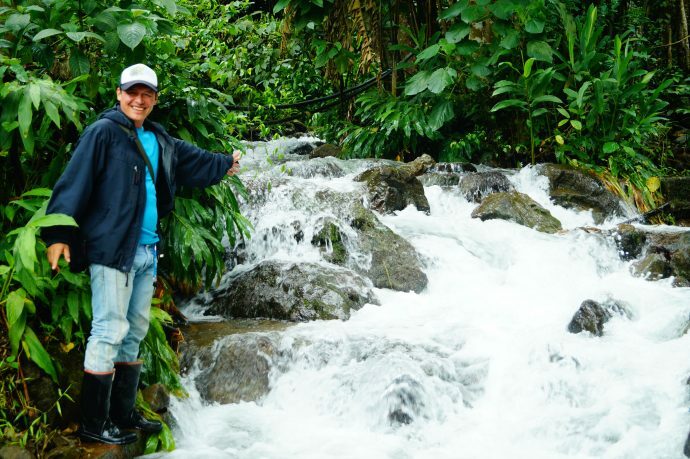 Abundant water underpins our agriculture, manufacturing, and tourism industries. In theory, clean water should be incredibly valuable—water is essential to our lives and livelihoods. In practice, clean water is cheap. According to state officials, Coastal Virginia is home to the second largest U.S. population at risk from climate change (second only to the people of New Orleans). Because of the added problem of land subsidence, sea levels along the Virginia coast are rising faster than the global average, with some estimates projecting a relative sea level rise of two to five feet within 100 years. When over 800 Minnesotans gather in a windowless basement on the first beautiful spring-like day, there must be a compelling reason. In this case the reason was water. In spring 2015, the Pollution Control Agency released a report stating that half or fewer of the lakes in Minnesota watersheds dominated by agricultural and urban land fully support the standard for safe swimming, among other things. Residents of the Land of 10,000 [Beloved] Lakes were alarmed and asked for change. U-Spatial provides support for spatial research. We make maps. And help colleagues at the University of Minnesota discover and analyze geospatial data. We collaborate with people in public health, nursing, business, history, anthropology, education, design, engineering, natural resources, and even dentistry.